“What are days for?” Laurie Anderson asks in her film Heart of a Dog. “To wake us up.” That’s what artists like Anderson are for, too. Her days revolve around words, art, music, Buddhist outlooks, empathy and love through multimedia creations that portray a woman comfortable in her heart and generous with her thoughts. 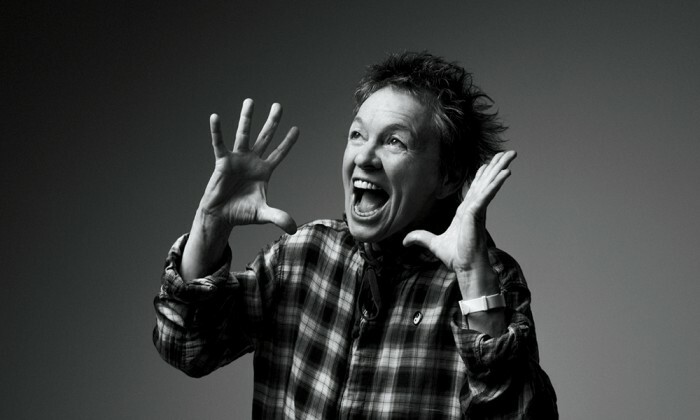 Laurie Anderson, her one-woman exhibition, fills Guild Hall Museum’s galleries this June and July with works both vintage and brand-new that employ language, imagery, sound and virtual reality through filmmaking, poetry, music, and conceptual and visual artistry. Anderson, a trained violinist and sculptor, left behind traditional forms of art early in her career. For decades she’s been pushing boundaries, establishing new conduits and embracing technologies via a path of communication and sharing. 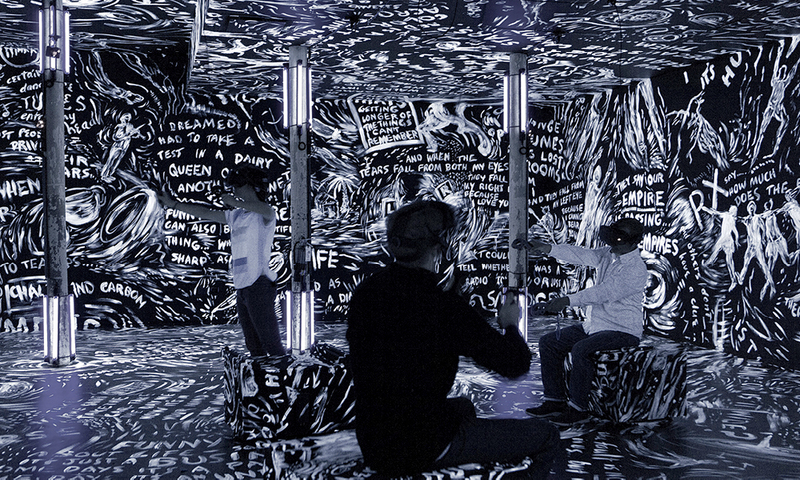 Over the years, Anderson has collaborated with a who’s-who of creators and progressive thinkers, from her late husband Lou Reed to Beat Generation author William S. Burroughs to renowned musicians like the Kronos Quartet to artist Hsin-Chien Huang, with whom she created her ground-breaking 2017 VR installations to her beloved terrier Lolabelle. 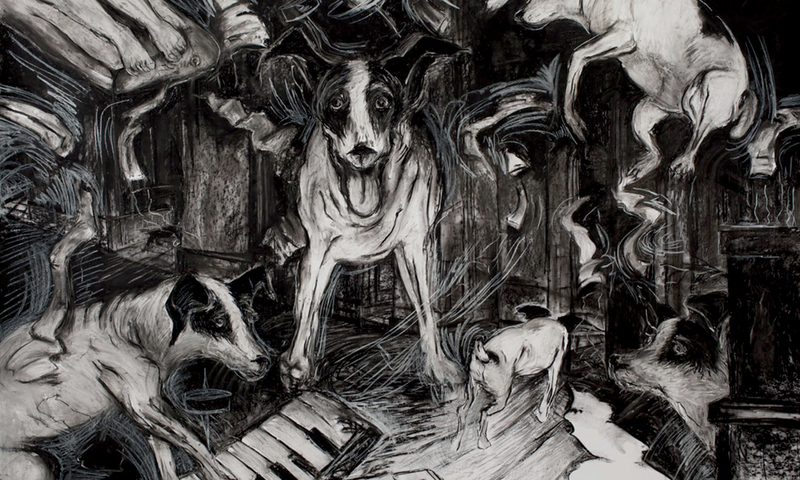 Anderson’s work is cutting-edge but rooted in things that go to the beginning of time or step entirely beyond it, as in her Buddhist-inspired meditation on the afterlife, “Lolabelle in the Bardo.” It covers almost every inch of the Moran Gallery with monumental, 10 x 14 foot drawings of Anderson’s dog Lolabelle. 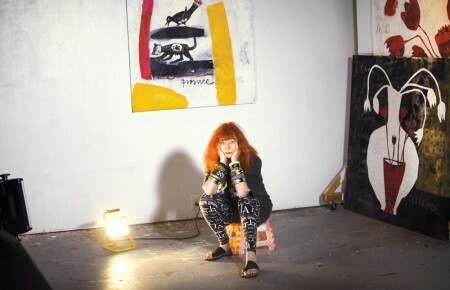 Ethereal, evocative, meditative, intellectual, fiercely creative and surprisingly down-to-earth for an artist who makes art to help herself and others feel as though they’re flying, Anderson and her work are borne by an undercurrent of love.